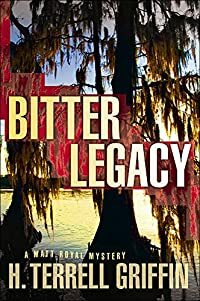 Bitter Legacy by H. Terrell Griffin: Synopsis and Online Purchase Options. Synopsis (from the publisher): After a week away, Matt Royal's ready to get back to the Longboat Key good life good fishing, good food, good beer, and more good fishing. But Matt comes back to bad news: while he was away, a sniper tried to kill one of his best friends. Even worse, now that Matt's back, someone's trying to kill him. And whoever is trying to kill him is trying really hard. With no clue who's after him or why, Matt soon finds he's at the center of a mystery involving a lawyer's murder, a tourist left for dead, a ruthless biker gang, a reclusive billionaire with nothing to lose, and an ancient document that could bring ruin to some of the most entrenched financial interests in Florida.Between solving the mystery and staying alive, Matt's got his hands full. But he'd better watch out or his hard-charging ways could get him sideways with the newest member of Longboat Key's police force, the undeniably attractive Jennifer Duncan. For Matt, it's shaping up to be a really long week.